Shortly after we moved back to New England I made a list “6 New England Things to Try,” that was comprised of some of the region’s most beloved items. In the little over a half a year since we have been year (where has 2011 gone!? ), I am 2/3 of the way through my list. Inspired by Adam Richman’s trip to Maine on an episode of “Man v. Food,” one of the must-try items on my list was the lobster roll. Chunks of fresh lobster mixed with a little bit of mayo and piled high on a roll. Being one of the top things I needed to try, I had been asking around for recommendations since moving back to Mass., which garnered some great tips from long-time locals. One weekend, Brett and I ended up at The Beach Plum’s Portsmouth, NH location delving into a huge sandwich. 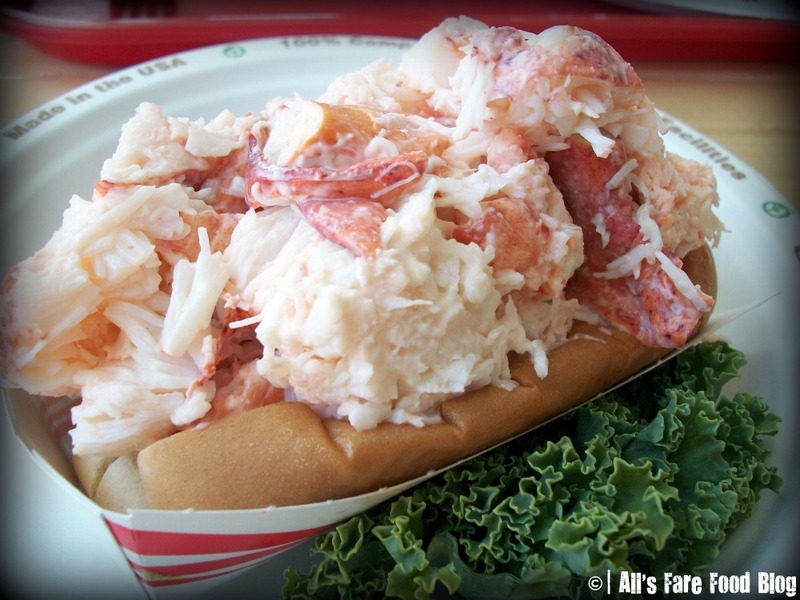 The Beach Plum was voted “Best Lobster Roll in New England” in 2010 by NECN.com. But, we didn’t end up at this cozy shack based on NECN’s review. We actually received the recommendation from the great folks at Chococoa Baking Company, who are known for their whoopie pies, another one of the six things that made my must-try list, and where I ended up having my first whoopie. The Beach Plum’s lobster rolls come in two sizes – the regular (pictured above) or the foot-long. The lobster “salad” is made mostly of large, lump pieces of lobster and minimal mayo. The mixture is piled into a hot dog-style roll that is lightly toasted on the grill. It’s a messy concoction that is served with sides of cole slaw and p-chips. I was a little leery of the sandwich since I’m not the biggest mayo lover. But the Beach Plum’s version won me over since they err on the side of caution with their mayo use. The lobster meat really is the star of the show here. Even though the sandwich is pricy, it is a good beach food that just says “summer.” I would say that a quality New England lobster roll is something to indulge in at last once a summer. This summer I have also tried my first Fenway Frank. Honestly, it disappoints me to say this, but the Fenway Frank hot dog does not live up to the hype. The hot dog that I enjoyed in June – when my hometown Milwaukee Brewers took on the Sox at Fenway – was slightly better than the frozen one that I had eaten earlier this season at an April game. Still, the hot dog was lackluster with minimal snap and served on a piece of Wonder-type bread. In the realm of Major League hot dogs, the Fenway Frank by Kayem is far behind the hot dog at Miller Park by Usinger’s that is served with Secret Stadium Sauce. I’m so sorry to say this, Boston, but you need to work on that dog. Finally, the last of my recent New England tastes was the lobster pie – a baked conglomeration of lobster pieces and Ritz crackers. Recently, we had some friends from Brew City in town visit Maine so we met halfway in Kittery, Maine, at the Weathervane, a restaurant where Brett’s family went and he had great memories of the seafood and the ambience. While the ambience is great (and the location is right across the street from an outlet mall), the food and service at the Weathervane was mediocre. Our orders were mixed up or missing items, and finally when we received our meals, they were lackluster and didn’t live up to the long wait. 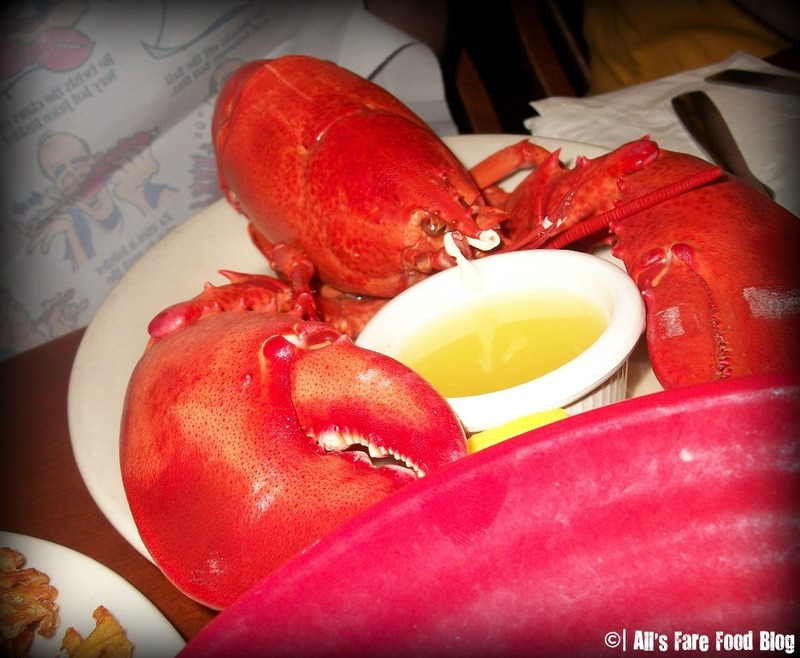 Pictured above: The steamed lobster at the Weathervane that our friend Rhonda ordered during a trip to Kittery, Maine. My lobster pie was dry and grainy. The lobster lacked any substance besides being rubbery. The stuffing of crab and crackers was almost like chomping on insulation. Honestly, I need to find a true New England experience for a lobster pie because I can’t believe that the version I ate was anywhere close to the best. I had gone in with such huge hopes and was immensely let down. Still up on my culinary journey of Six New England Things to Try are chicken pies and shabu-shabu, a Japanese-esque type of fondue. I hope those two, and another try at the lobster pie, live up more to my expectations – just how the lobster roll and whoopie pie have. This entry was posted in Cuisine - American, Cuisine - Desserts, Cuisine - Japanese, Cuisine - Seafood, Foodie Firsts, Places - Boston, Places - Massachusetts, Places - New England and tagged Beach Plum, Chococoa, Fenway Frank, hot dog, Kayem, lobster, lobster pie, lobster roll, New England, New Hampshire, Portsmouth, sandwich by Christina. Bookmark the permalink. Where’s the pictures? More pictures needed.